In his Windsor chairs, Richard Grell makes pieces of history. And he wants to show you how he does it. For more than 40 years, Grell, a completely self-taught and highly talented man dedicated to fine woodworking in the style of America’s 18th century craftsmen, has been creating what are considered to be the finest Windsor chairs available today. Grell is known for his unrivaled variety of Windsor styles and finishes. After college and a short career in the aerospace industry, Richard followed his woodworking dream and in 1972 became a Windsor chairmaker. As a child, Richard demonstrated patience and a natural talent for working with his hands-skills he has brought to his craft through the years. He credits his grandfather for recognizing these traits and nurturing his love of woodworking. Richard’s attention to detail reflects that nurturing to this day. As a one-man-shop, he is involved in every step of each chair’s creation. He does not buy parts. 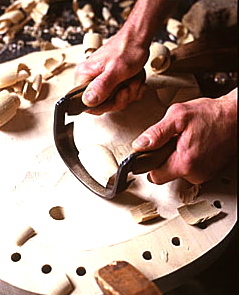 Throughout his career as a master craftsman, Richard has been educating people about the history of Windsor chairs and their unique construction characteristics, by lectures, seminars and, due to the high demand for his chairs, limited instruction. 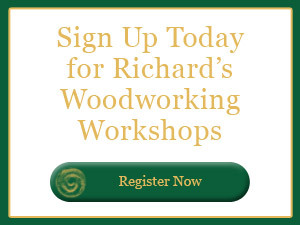 Richard brings a passion for woodworking, sharing his knowledge and his exclusive woodworking and painting techniques to all his classes. This master craftsman and educator teaches and shares his 41 years of experience in his inspiring workshop and beautiful home in historic Hudson, Ohio.